Heat oven to 375°F. Line baking sheet with parchment paper. In a small bowl, combine olive oil, salt, Italian seasoning, and garlic powder. Unroll dough; brush with olive oil mixture and twist. Place on baking sheet and bake for 12 to 14 minutes. Combine mozzarella, tomatoes, and basil. Season with salt and pepper. Pour mixture into a small baking dish. Bake for 15 minutes, then broil for 2 minutes, the top should be golden and bubbly. Garnish with additional basil if desired. Serve with breadsticks and balsamic syrup. Caprese salad is crazy popular in the summer. You know, ripe tomatoes, fresh mozzarella, and basil. It is fresh and light and gorgeous, and just screams summer. I thought it’d be fun to do a new spin on it. I decided to make a hot version, and guess what? It is ah-mazing! 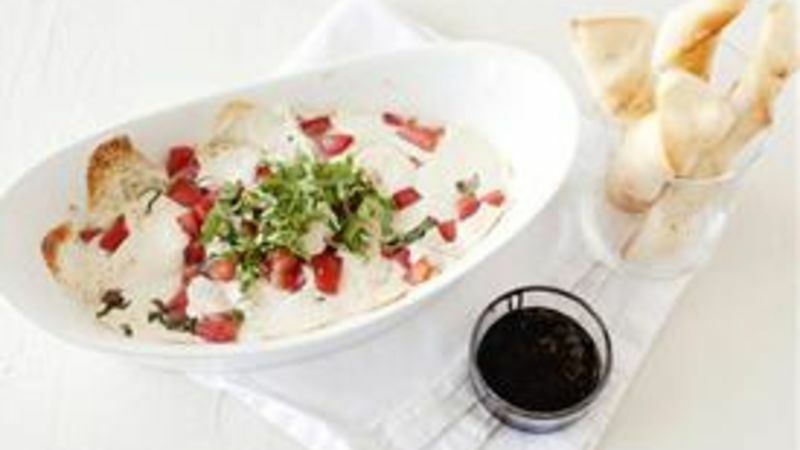 My Hot Caprese Dip is going to be making many, many appearances at my summer parties. Breadsticks, yup, slathered in olive oil and herbs. I got super fancy and bought some balsamic syrup at the store, when I dipped my dip into that, OMG. Tip - If you cannot find balsamic syrup in your grocery store, it is really easy to make on your own. Put about a cup of balsamic vinegar in a small sauté pan, and bring to a boil over medium heat, let it cook down until it is reduced to about 1/4 cup. Start with a chub of Pillsbury breadstick dough. Brush the dough with olive oil and Italian seasoning. Twist and place on a parchment-lined baking sheet. Grab the rest of the ingredients. Toss the cheese and tomatoes in a bowl. Throw in some basil, and season with salt and pepper. Put the cheese mixture into a small baking dish. Bake in a preheated 375-degree oven for 15 minutes, then broil for 2 minutes to get the top brown and bubbly. Serve with balsamic syrup and breadsticks.